et pluie et vent were Laurent’s words for the weather we encountered today. It all started with the vent – 20 mph from the wsw. That, alone, sent us north after we filled up with diesel ($4.89/gallon) at the marina’s gas dock. As we putt putted up the river, black clouds scudded overhead; and, as they passed, they gathered strength over Essex Bay. That’s were we saw and heard the eclair and tonnerre. Flashes of lightening and muffled thuds of thunder were under the clouds over the water. We decided not to go too far and stopped just north of Plum Cove at a spot we call S & M. That used to stand for the initials on the porches of two side-by-side summer houses overlooking the site. Both are now under renovation, probably by new owners, because the initials are gone. Nevertheless, it’s still S & M to us. Pete and I were looking for video subjects as well as lobsters and crabs for his afternon work in Chinatown. They’d specifically asked whether he ever caught crabs and we were trying to get them some. The water was 22 feet deep and it was only 43 degrees. Visibility was murky at 10 feet and the tide was falling. We didn’t find anything worth taping and only three crabs. Laurent, on the other hand, found a lumpfish to video and a lobster that was legal. As we were swimming back to the boat, I saw drops of pluie hitting the water in a steady rain. Rats! I drove home in my drysuit to keep from getting wet and cold. Then the sun came out. I’d forgotten to bring a hat and got too much sun on my face. Sunburn on a cloudy, windy, rainy day? Yup, we had a little bit of everything today. Memorial Day and what a memorable one it was. Wind from the southwest at 10-20 sent us north for the first time this season. We had Jon Bulman, Paul S., and Laurent Dubois along today. As I pulled into Folly Cove the water flattened and cleared until we motored far in and dropped anchor at the graffiti we call A.R./E.R. The anchor was on a sandy bottom in about 20 feet of water. It looked crystal clear. We suited up right away and there were four video cameras in at once. I saw a tiny nudibranch floating along in a piece of sea weed, some anemones, and friendly flounder around the anchor. There was also a rock gunnel wrapped around the anchorline at about 5 feet off the bottom. He floated free when he saw my camera approaching and swam straight towards the lens. What a surprise. Fish usually flee. We made both dives from this one anchorage. On the second one, Peter, Jon and Laurent went in search of new vistas and found lots of skates. Peter caught one by hand and Laurent videoed the event. The visibility was about 10 feet above the thermocline and about 15 feet below it. The water temperature was 50 degrees on the surface and 45 at about 20 feet. The ride back was easy even though the wind had built to 20-30 from the WSW. The boat handled the chop easily. A great start to the summer. Laurent Dubois created a mini-movie of his video efforts on Saturday, May 24, 2008, and posted it on YouTube. It contains the footage he caught of an urchin turning itself right side up after having been up-ended by the videographer (guess who?). The urchin antics start at about 2:57 of the 6 minute video. Catie Childress and Peter Donahue found this relic on Saturday, May 24th, 2008. Tom and Catie were back for more. We also had Bill Low and Laurent Dubois. Kathy Cardinale joined us as crew and bearer of “legal” lunch makin’s. I wanted to try to video the critters as Pete and Catie caught them. We went back to what had been flounder city at the wreck of the USF NH just off Graves Island in Manchester. The flounders weren’t coming out to play but lots of crabs and lobsters did. Catie was fearless and let me video her with everything Pete could find to put in her mitt. She also took her own underwater pictures and that was neat to watch. 15 years and 9 months. Imagine if you or I had learned to scuba dive at that age. We’d have had a chance to do so much more with that headstart. The water had warmed considerably as the tide was dead low. Visibility was about 10 feet. Pete got 50 degrees at 25 feet. It felt very comfortable to me. Maybe that was because I was swimming hard to keep up with the video subjects. I was wearing Tom’s Rocket Fins because he needed to use The Captain’s XXXL Force Fins so The Captain had to use my XXL Force Fins in his stocking dry suit feet. It was a kind of round robin fin swap because Tom was practicing in his new dry suit from Freedom Diving in Gloucester. Our second dive was at the western, deeper side of Kettle Island. Peter and Catie and I again were critter hunting. Catie even managed to follow Pete into a swim through at about 40 feet. I tried to video them coming out, but misjudged the exit route. They swam out right below me even though I had been following their bubbles carefully. Oh, well. Maybe next time. Laurent found lobsters and noted the temperature was 42 degrees at 55 feet. We had noticed a definite thermocline at about 25 feet with a terrific improvement in the 10 foot visibility below it. I’d guess it was about 20 feet in the co-o-o-old water down there. We saw Fran Linnehan’s boat Down Under with a full charter. One of his customers needed a weight belt and we loaned him one of our extras with lots of extra lead, just in case. It would have been a real sad day if a scuba diver had come all the way to Gloucester only to find they’d left their belt behind. Happy to be able to help. Saturday was going to be the first good diving day of the season, according to the weatherman. We’d had such a long, slow spring that a warming Memorial Day weekend trend was welcomed by everyone. We had a full charter with Jacki K., Laurent Dubois, Tom and Catie Childress, and Billy and Cathy Myers. Tom and Catie came all the way from Amherst, while Billy and Cathy came from Chicopee. Jacki and Laurent are closer, but we appreciated the effort everyone made to get to us. Because this was going to be 15 year old Catie’s first dive of the season, we picked a site she’d been to before – The Wreck of the New Hampshire. Pete took her diving and they saw lots of critters. She even got to hold a flounder in her hand. 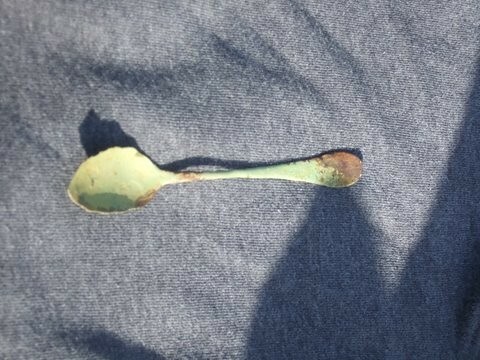 Then they went excavating and she found a spoon that looked like it was melting away with corrosion. Pete called it the very spoon that Paul Revere had used to eat his corn flakes. It looked every bit of that age. Catie will take a picture of it and I’ll post that when I get it. Laurent took his new HD video camera and housing in to film urchins turning themselves right side up after having been placed gently on their backs by the cameraman. I’d never seen them do this, but I knew they must have the capability otherwise storms would destroy them. He posted the results of this effort on YouTube. I’ll add the link when he sends it to me. They really look like they’re using those little legs to pull themselves over. The second dive was at the east side of Egg Rock. There’s a neat groove in the rocks at about 30 feet that runs the length of the rock. The wind would blow and the sky would darken and we’d be riding the anchor hard. Then the sky would brighten, the wind would slacken and we’d be enjoying the calmness of the moment. Strange conditions. The water was getting a little warmer. Pete had 46 degrees at 30 feet at the USF NH and 44 degrees at 31 feet at Egg Rock. Sunday dawned bright, clear, and a little warmer. 62 degrees seems almost summery. Bill Low and Laurent Dubois joined Pete, The Captain, and me for a trip to whatever calm water we could find. There were low rollers coming in from the south east and the breeze was from the north. It made the inside of Kettle look heavenly. We suited up in the lee of the island from the rollers and watched the breeze swing around to the southwest. As we jumped in, the boat was swinging to accommodate the new wind direction. I checked the anchor and found it had adjusted itself. I love Danforth anchors. I videoed little critters up in the rocks at Kettle. The visibility was still only about 10 feet and it was 44 degrees at the bottom at 25 feet. There were lots of hermit crabs, some with little limpet-like shells growing on their backs. Laurent found a grey lumpfish, but had left his camera on board to go lobstering. He also found a blue-eyed scallop. Again, no camera. The Captain videoed right under the boat in his new 60cf tank and decided it was much heavier than his steel 70. He’ll be taking some weight off his belt. Peter fixed my Fenzy’s automatic inflator bottle which, it turns out, was empty. I couldn’t get it to turn on during yesterday’s trip to Paddock Rock and had inflated my Fenzy by mouth while I waited for the boat to pick me up. Now I’m back in business. The second dive was going to be somewhere protected between Kettle and home. With the new southwest wind, we didn’t have many options. We chose to anchor beside the lah-de-dah mansions on the bluff beside Magnolia Harbor. It was about 20 feet deep. There were skates and plenty of them here. I videoed one that let me get very close and one that looked old with greyish white patches on its back. Pete’s Alphabet Vegetable Soup tasted marvelous because my legs were wet and cold. Seems I have cracks in the boots of my drysuit. Ted Barnes of Freedom Diving is going to get them replaced and lend me one of his rental drysuits while it’s being done. What a good guy he is. That means diving the shallow site first and the deeper site second. We didn’t start out to do that this morning. Rather, we planned to pillage the site of the USF New Hampshire in one of the first boat dives to be there after the winter rearranged the bottom and its treasure. The site of the USF NH is 25 feet deep at a real high tide like it was this morning. Joe Finkhouse, Laurent Dubois, Kevin and Linsley Mordasky and Juli were up for anything. That’s why we love having them come with us. Having divers with a positive, upbeat attitude about the scuba possibilities in early spring helps keep us going. The water was greenish, even though there’s a posted red tide warning. From the bottom, looking up, I saw a murky, milky silty layer in about 5 feet. Didn’t look red, though. It was still 44 degrees on the bottom. I videoed critters having breakfast in the sandy dredged groove our anchor had made. Laurent took his new HD video camera and housing underwater together for the first time and practiced not moving the rig. It’s hard to do, trust me. Especially when there’s any kind of surge at all. When everyone was back from the first dive, we started talking about where to go next. Since our movie this year is going to be about Paddock Rock, I looked straight south from the stern of Easy Diver and recommended we try it right then. It looked pretty calm out there and there was absolutely no passing boat traffic to rock and roll us as we suited up. We were already suited up and almost ready to go. Everyone was up for it. We used our GPS unit to find the rock. It worked great and we anchored on the rock with our first pass. Pete jumped in to be sure we were where we thought we were. He also checked the anchor and found it to be hung up with one fluke in a notch on the ocean side of the rock. He cautioned us not to use the anchor line to pull ourselves down, but to just swim beside it to descend. Anyone pulling on the anchorline could disengage it from its crevasse and the crew remaining onboard would have to motor around waiting for everyone to surface. I descended beside the anchorline in what seemed to be a lot of current. I was chugging along and carrying my video camera as well. I hooked a left at the anchor and dropped into the notch in the rock that bottomed out at 85 feet. It was dark. It was black. Visibility was 10 feet or so. It was 44 degrees. I videoed some dead man’s fingers, a sponge. There was also a scarlet psolus. The surface looked green and diffused from the sand. I didn’t find any of the other divers. Since I only had 1500 psi in the tank when I started, it was not long before I needed to return to where it was warm and there was plenty of air. On the way back up, I missed the anchorline and assumed it had broken free. I decided to just surface and look for the boat there. As I rearranged myself on the surface, I saw three sturdy types in perfect unison, assuming the OK posture on the stern. I was OK, so I gave it back, but it was wonderfully reassuring to know that such concern was in place for my well-being. What sweethearts! They powered up to me and practically levitated me onboard. Everyone else made it back just fine. No issues. No sweat. Next time, I’m taking more air on this dive. We were ready for a little more video testing and were only going to go into the harbor because it was still windy. That was the plan. I was driving once Pete got the boat out of the slip for me. I hate having to make a quick manoeuver into the wind as we leave the finger dock. I’d rather bark directions to Laurent, John or Bill Low to “keep the bow line tight” or “watch the stern corner.” Then I can climb up to the driving station and motor down to the Blynman Bridge while Pete and the others get suited up. Everything was fine as we passed under the bridge without even needing it to be lifted for us. The tide was almost low and we had plenty of room to make it under if we lowered our antennas. As we entered the harbor, I saw a fellow doing Tai Chi (sp?) at the railing overlooking the cut. He waived from the pose he was in. Great balance. As I turned towards the harbor mouth and slowly started increasing speed, I noticed that the engine wasn’t responding as it normally did. It wasn’t reving as fast as it should be. In fact, it was losing RPM. What’s going on? It felt like the time we had run out of fuel. As everyone realized what was happening, The Captain directed me to back it down and do a slow turn towards Stage Fort Park while they opened the engine compartment to see what they could find. They found water bubbling in the separator so we stopped everything and set the anchor. We were protected from the worst of the wind and everyone (Bill Low, John B., Laurent Dubois) was fine with the temporary delay. Of course, we were in no danger of sinking, just of having the engine be ruined from water in the diesel fuel. We decided that Pete and I would row to shore. He’d then walk back to the Cape Ann Marina to get diesel in a jug. He’d then walk back to the inflatable and we’d row it out to Easy Diver. In fact, he got a lift from Peter, the dockmaster at the marina. By the time he’d called me with the new plans, I was able to beat him back to the boat by a super human effort of rowing myself up into the north wind from the rocky shore where we’d beached the inflatable. Peter times two arrived with the fuel and we rigged a hose to the engine to deliver it. I put-putted back to the dock and Pete did a masterful job of docking against a lessening north east wind. How did the water get into our fuel? That’s the question of the day. Everyone helped us pump the fuel tank into containers and to measure the amount of water in them as it separated. Fran Marcoux and his son, Matt, of Daybreaker were extremely helpful with buckets and bottles and containers from their collection, as well as their knowledge of what to look for in the contaminated fuel. This was not what we’d planned for on a sunny Mother’s Day. Today, Saturday, May 10, was predicted to be rainy, as well as breezy. I wasn’t looking forward to another wet weekend, but the morning dawned without any rain. But the wind was beyond breezy. How about 20-30 from the North? Our return and re-docking would be a bear if we decided to go out at all. The Yankee Fleet boats had canceled their trips. No other boats were going out, it seemed. We called off Joe F. and Richard B. who had booked in advance because we wanted them to have a good time and not regret the decision to dive with us. However, the crew (Peter, Fred and Chris), Laurent Dubois, and a NAUI Instructor candidate, John B. decided we would go into the harbor for one dive just to get our feet wet. We knew it would be hard to find any calm water or any good visibility because it was going to be dead low tide. Pete chose the spot because he was driving. It was Ten Pound Island. Murk city. Silt squared. John said the water temperature was 44 degrees at 24 feet. I helped Pete move the anchor from its entanglement in a lobster line and he lost his fin in the sucking silt in the process. The cloud of dust that arose as we reset the anchor was a blackout. However, as I looked to my right, I saw two geysers of grey silt spout straight up into the water from the untouched sand. Clams protesting the noise? Sea worms agitated at the disturbance? I stayed right where I was and hoped I could feel around to try to find Pete’s missing Force Fin. As the current gradually moved the silt away, I could see it gleaming in towards shore and raced him to get it. Lucky break. Pete had already cooked soup before we hit the water so it was hot and ready when we got out. We were in for about 20 minutes and my hands were OK. John B. was in a wetsuit and had five finger gloves. He was frozen. Laurent found a pin hole leak in his DUI dry suit’s cuff. He described watching the “bloop, bloop” as bubbles escaped from his wrist. Not a good sign. However, his new video housing was dry inside and good to go with his new HD video camera inside on Sunday. We loaned him some Aquaseal to goop up the hole before tomorrow’s dive.